Photos of Assam, India from a two-week river cruise on the Brahmaputra with Assam Bengal Navigation, the first Indian river cruise company. Well, this isn’t what I expected from my luxury river cruise in India. A carpet of shockingly yellow mustard flowers spreads before me, punctuated by a pair of skinny legs touching the sky in a cheeky handstand. The tang of fresh coriander from the next field over tickles my nose. Cackles of curious children clicking the camera at my hip should make me nervous—I’m here on a photography assignment, and a broken camera is not an option—but all I can do is laugh and remind them not to leave fingerprints on the lens. This little Bangladeshi village of Khirakanta, on one of the thousands of islands amongst the Brahmaputra River, seems simple and insignificant. But looks can be deceiving; our Assamese guide, Mohan, tells us these fields supply most of the vegetables for Guwahati, Assam’s capital city. Mohan leads us ‘round piles of purple aubergines, through rows of bamboo houses. Curious looks and smiles run rampant as locals gather to watch. Contrary to other villages in more touristic parts of India, there are no begging hands, no pleas for pens. We troop through backyards and courtyards, yet no one is particularly bothered by strange foreigners wandering through their homes; if anything, they’re amused. Whatchu up to, silly foreigners? Before boarding our painted “country boat” to return to the main cruise boat, a girl in blue comes forward and gifts me a bag of freshly picked vegetables with a shy smile. I can’t identify half of the different varieties, but I grin with thanks, and climb aboard the boat with a wave of goodbye. The gaggle of children trailing behind us wave with gusto as the little blue boat sails off across the Brahmaputra river. The walk was no opulent Raj-era outing, nor something you’d find on someone’s Great Indian Bucket List; just a simple stroll through one of the many riverside villages of Assam. But these kinds of simple pleasures and surprises are what made my cruise with Assam Bengal Navigation truly memorable. Prior to the assignment, I expected a pleasant if uneventful cruise down the Brahmaputra river, playing photographer at bucket list sights I’d already seen. Assam was not new territory—I spent several months in Assam and the northeast earlier this year—but cruising with Assam Bengal Navigation was a chance to see Assam from a whole new perspective. Misty mornings greeted our strolls through remote villages I’d never be able to reach on my own. Whispers of cows sifting through rice straws and the clickety clack of women weaving on wooden looms served as our strolling soundtrack. In these areas, it’s common to drive cows in a circle through piles of harvested rice to separate the grains from the stalks. This local lady was excited to show off her weaving: a gamosa, a traditional Assamese scarf. Muggy middays in Kaziranga National Park brought herds of elephants shuffling across dusty roads mere meters away, and baby rhinos trotting after their mothers through the grasses alongside our open jeep. … and then there was that day we casually watched 20 or so elephants cross the road in Kaziranga. No big deal. On the same day, Mohan spotted a tiger from the country boat. Also no biggie. Can you find him? The first day in Kaziranga, our group asked to stop every time we saw a rhino off in the distance. Our driver laughed. “Wait until you visit central Kaziranga. Then you’ll see many, many rhinos much closer than this.” He was right. Some afternoons of sailing were peaceful and without issues. Others—to my devilish amusement—were more eventful as the crew scrambled to dislodge the grounded boat from one of the many sand banks lurking below the shallow winter water levels. Note the churning sand as the boat strains to unstick itself from the bottom. We were stuck here overnight, but it was hard to be too bothered about it with sunset views like this. When all else fails, a government tugboat is called to push the boat off the sand bank. Never fear, between tugboats and the country boat, you’ll never have to worry about missing your flight or train because you’re stuck… unless acts of god(s) are at play. Breezy evenings were spent sipping cold beers from the comfort of wicker chairs on the boat’s sundeck. Around 16:30, the boat’s growling engine gave way to still silence—no sailing after dark—as we anchored on islands and riverbanks in time to enjoy some of the most spectacular sunsets and sunrises I’ve ever seen. At the start of the voyage, I was ambivalent about the idea of being stuck on a boat for so long. Two weeks later, I’d do anything to be back on board. It’s an especially easy statement to make, given my current circumstances. I’m writing this from an ancient hotel in the depths of Calcutta, mere days after leaving the boat. The walls on the street are all peeling and coated with grime; the honking of motorbikes outside never ceases as drivers dodge men peeing against the wall near my window. To escape the incessant pollution of my senses, I lose myself in reveries of life on the Brahmaputra. Life was dreamlike throughout the cruise, too; there was something definitively surreal about stepping out of modern-day Indian chaos and onto the deck of the historic Charaidew. Wooden floorboards creaked beneath my feet as I circled the dining room, admiring portraits of Maharajas from the days of yore. 1920s editions of Rudyard Kipling novels intermingled with maps and avian field guides on the tables and bookshelves in the boat’s saloon. A cup of Assamese tea warmed my hands as Romeet, the boat’s manager, relayed the history of the ship: it was one of the last barges used to transport tea and goods down the Brahmaputra river more than 40 years ago. Could be 1977, could be 2017. The boat’s age did have its downsides at times. Occasional issues with power cuts and disappearing hot water arose over the course of two weeks… but remember, this is India! Nothing ever goes precisely according to plan, and that is half the fun. Assam Bengal Navigation’s fleet includes newer and more luxurious boats—generally reserved for Ganges cruises, though a new and far more luxurious boat will be introduced on the Brahmaputra in October 2018—but the Charaidew is where an era ended and a new story began. The experience of being on such a significant and nostalgic boat far outweighed the issue of an hour without hot water. In my opinion, anyway. No power steering on this boat! Is cruising with Assam Bengal Navigation right for me? Despite my pre-cruise skepticism, at this point, I’m sold. The crew was excellent, the excursions interesting, the boat more than comfortable. There was a harmonious balance of seclusion aboard the boat, and immersion in local life once on land. 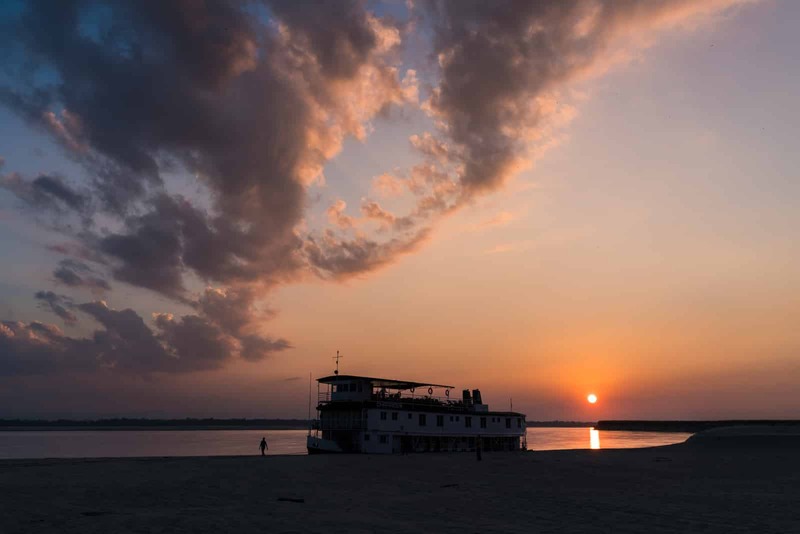 Cruising the Brahmaputra with Assam Bengal Navigation was a true pleasure, one I would happily recommend to any family, friends, and followers who can afford it. … constantly need to be doing something. The shorter 4-day cruises are relatively packed with excursions, but the longer cruises involve a lot of sailing and free time. If you’re an antsy traveler, think twice, or opt for a shorter cruise. … like to have everything just so. Sailing on the Brahmaputra can be unpredictable at times. In mid-December, there were several days where our departure was delayed due to fog. The ship got stuck several times as river channels shift every few hours, and sand banks change every monsoon. Neither the ship’s design nor the captains’ mad skills are to blame—getting stuck is simply part of sailing on the Brahmaputra! If a beached boat sounds more stressful than adventurous to you, take note. … need ultimate luxury. Though the boat is luxurious, and the local workers (important) are all impeccably trained, it’s not the kind of place where you need to get dressed up for dinner and have men in penguin suits catering to your every whim. I admittedly showed up barefoot to every meal, and that was a non-issue. I think. If, however, you’re looking to adventure to off the beaten track parts of Assam without sacrificing your comfort, this is the way to do it. Catch you on the Brahmaputra? 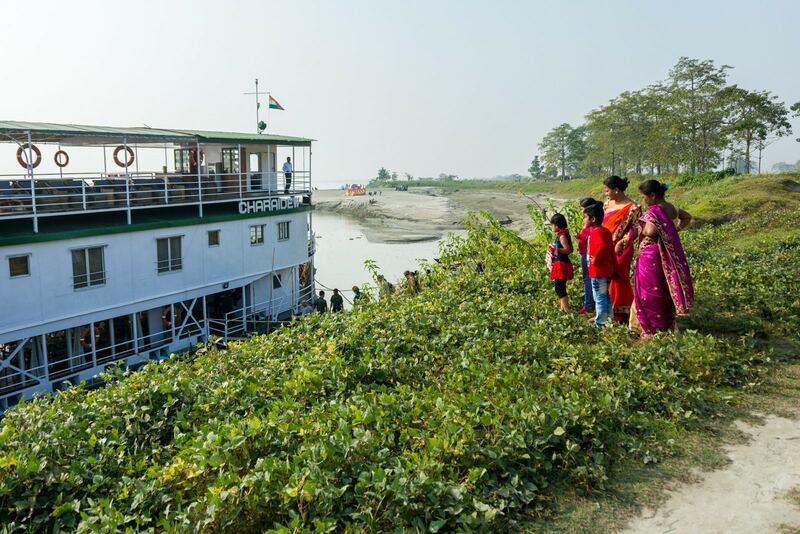 For more information, check out Assam Bengal Navigation’s website for Brahmaputra cruise itineraries and schedules for future cruises. Good Lord – I LOVE it! I have been to India several times but never to the North East. I would absolutely love to be stuck on a boat and put my camera to work if the views are as incredible as you present. What a wonderful way to explore a unique part of the world! Thank you so much for sharing this with us. Assam is a beautiful and lush green state. I still have Assamese Tea at home. My Muga silk Saree is going to arrive soon. I’m glad you enjoyed it—Assam is a beautiful state!